102 stories of American pride. The miraculous story behind the rise of the "Cathedral of Dreams" that would, for a time, become the world's tallest and most famous skyscraper. Japan's internal political dynamics, especially the bitter rivalry between its army and navy, played a far greater role in propelling the nation into war with the US than did its economic condition or even pressure from Washington. CBI - China: Day 107 of 142 of the 1st Battle of Hebei. Spain: Day 275 of 985 of the Spanish Civil War. Spain: Day 640 of 985 of the Spanish Civil War. CBI - China: Day 285 of 2,987 of the 2nd Sino-Japanese War. Day 70 of 124 of the Battle of Henan. Day 25 of 39 of the Battle of Xuzhou. Germany: Messages are sent out to 30 of the 31 countries (except Poland) named by US President Roosevelt, asking them whether they feel threatened by Germany. They will all respond saying they do not. CBI - China: Day 650 of 2,987 of the 2nd Sino-Japanese War. Day 32 of 54 of the Battle of Nanchang. Atlantic: German sub U-13 sinks the British steamer SWAINBY 25 miles north of the Shetland Islands, Scotland. 38 survivors will reach Nor Wick Bay in lifeboats. ETO - Norway: Day 9 of 63 of the Battle of Norway. The British cruiser HMS SUFFOLK shells the German controlled airfield of Sola at Stavanger. CBI - China: Day 1,016 of 2,987 of the 2nd Sino-Japanese War. Day 155 of 381 of the Battle of South Guangxi. Atlantic: German motor torpedo boats attack an Allied convoy off Great Yarmouth, England, sinking 2 small freighters and damaging a large steamer. Atlantic: German sub U-123 sinks the Swedish MV VENEZUELA 600 miles west of Ireland. The crew of 49 abandons ship in lifeboats, but they are never seen again. Atlantic: The Egyptian steamship ZAMZAM, with American passengers aboard, is sunk by German auxiliary cruiser ATLANTIC in the South Atlantic. 138 Americans are rescued. ETO - UK: Day 224 of 258 of the Blitz. 1,179 are killed in London. Germany: SS Untersturmfuehrer Maximilian Grabner at Auschwitz announces that urns containing the ashes of Polish political prisoners who had died at Auschwitz will no longer be sent to their families. MTO - Yugoslavia: Day 12 of 12 of the Axis invasion of Yugoslavia. Yugoslavia formally surrenders with their Foreign Minister signing the armistice. MTO - Greece: Day 12 of 25 of the Battle of Greece. New Zealand and Australian troops demolish the Pinios River railway bridge and hold the Tempe and Pinios Gorges. MTO - Libya: Day 8 of 256 of the Siege of Tobruk. The Italian troops make another failed attack on Tobruk. MTO - Libya: The British sub HMS TRUANT sinks the Italian ammunition barque VANNA off the Libyan coast, which was carrying ammunition and fuel to Derna. Middle East: In Iraq, Rashid Ali al-Gaylani's 16-day old government submits a request to Germany for military assistance in removing the British from Iraq. Meanwhile, Iraqi troops surround the RAF airbase at Habbaniya. East Africa: Day 312 of 537 of Italy's East African campaign in the lands south of Egypt. CBI - China: Day 1,381 of 2,987 of the 2nd Sino-Japanese War. CBI - Thailand: Day 199 of 221 of the Franco-Thai War (Vichy France vs Thailand). ETO - France: French prisoner of war General Henri Giraud escapes from the castle prison in the Königstein Fortress and joins the Free French Forces. In World War One he had been captured and escaped then, too. Germany, circa 1940-41: The captured French General Giraud, during his daily walk on the grounds of the castle prison of Königstein Fortress. Giraud planned his escape carefully over two years. He learned German and memorized a map of the surrounding area. On 17 Apr 42, he lowered himself down the cliff of the mountain fortress. He had shaved off his mustache and, wearing a Tyrolean hat, traveled to Schandau to meet an SOE contact. Through various ruses, he reached the Swiss border and eventually slipped into Vichy France. There he told Marshal Pétain that Germany would lose the war and that they must resist. 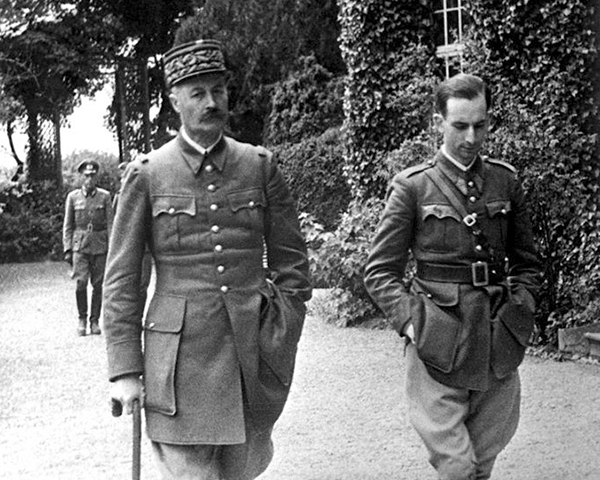 Pétain ignored his admonition, but the Vichy government refused to return Giraud to the Germans. Giraud left and joined the Free French Forces. ETO - Germany: The RAF makes a daylight bombing raid at Augsburg in southern Germany. The heavy losses start to convince the British that they should avoid conducting daytime raids. Atlantic: Day 94 of 169 of Germany's Second "Happy Time," during which U-boats sink 609 Allied ships with little risk. U-201 damages the Argentine tanker VICTORIA east of Hampton Roads, Virginia. Russian Front: The German government reduces the amount of provisions given to Soviet prisoners of war. Russian Front - North: Day 222 of 872 of the Siege of Leningrad. Russian Front - North: Day 69 of 102 of the Battle of the Demyansk Pocket, another failed attempt to break the siege at Leningrad. Russian Front - North: Day 85 of 103 of the Battle of the Kholm Pocket. Another attempt to break the siege at Leningrad. Russian Front - Center: Day 100 of 103 of the Battle of Vyazma, Russia. Russian Front - Center: Day 100 of 103 of the Battle of Sychevsk, Russia. Russian Front - Center: Day 46 of 49 of the Battle of Rzhev, Russia, a diversion to pull more German troops away from Moscow. Russian Front - South: Day 170 of 248 of the Siege of Sevastopol, Crimean Peninsula. CBI - Burma: Day 125 of 164 of Japan's Invasion of Burma. Day 7 of 9 of the Battle of Yenangyaung. The Indian 17th Division makes a failed counter-attack near Yenangyaung. Japanese and Chinese troops clash at Bawlake and Pyinmana. CBI - China: Day 1,746 of 2,987 of the 2nd Sino-Japanese War. PTO - Malaya: Day 58 of 357 of the Battle of Timor Island. The submarine USS SEA RAVEN begins evacuating Australian troops. PTO - Philippines: Day 131 of 152 of the 1st Battle of the Philippines. ETO - Germany: US 8th Air Force B-17s bomb the Focke-Wulf factory at Bremen. Germany: Hitler meets with a representative from Hungary and attempts to persuade them to deport Hungarian Jews. Russian Front - North: Day 587 of 872 of the Siege of Leningrad. Russian Front - North: Day 348 of 658 of the Siege of the Kholm Pocket. MTO - Tunisia: Day 152 of 178 of the Battle of Tunisia. RAF and US Air Forces provide Allied air support. MTO - Italy: US 9th and 12th Air Forces attack targets in Sicily. CBI - Burma: Day 69 of 79 of the Allied Operation LONGCLOTH. US 10th Air Force provides air support. CBI - China: Day 2,111 of 2,987 of the 2nd Sino-Japanese War. PTO - Alaska: Day 315 of 435 of the Battle of Kiska, Aleutian Islands. US 11th Air Force B-24s bomb the runway and gun emplacements at Attu. B-25s, P-38s and P-40s attack targets on Kiska Island nine times throughout the day. PTO - Japan: US submarine USS FLYING FISH sinks a Japanese freighter off the coast of Japan. PTO - New Guinea: US 5th Air Force hits a variety of targeted areas. PTO - Solomon Islands: US 13th Air Force night bombs the Kahili Airfield. USA: Millionaire aviator Howard Hughes and aviation pioneer Jack Frye fly a Lockheed Constellation airliner from Burbank, California to Washington DC in 6 hours and 57 minutes, breaking the world record. 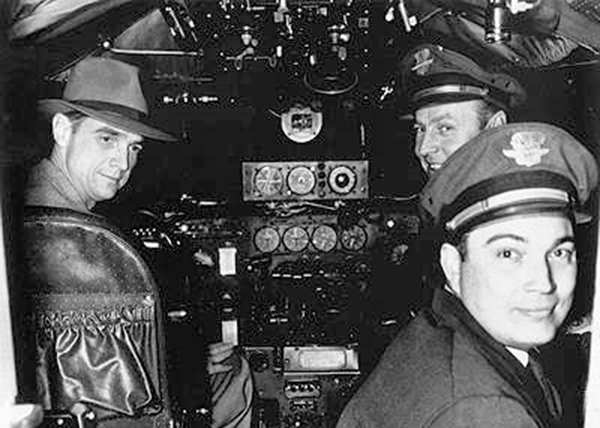 Howard Hughes (left, left, in the pilot's seat) and TWA's Jack Frye (right, flying co-pilot) in the cockpit of the Constellation. Designed just before WWII after special requirements from the American tycoon Howard Hughes, the Lockheed Constellation (the "Connie") is celebrated today as one of the finest flying machines ever built. As a civilian aircraft, it was the first airliner able to cross the Atlantic Ocean non stop, but it also has had a respectable military career, thanks to its brilliant characteristics which allowed it to serve in long-range transport and to fulfill missions of electronic warfare and AWACS (airborne warning and control system), known today as AEW&C (airborne early warning and control). ETO - France: US 8th Air Force B-24s bomb the V-weapon site at Wizernes. Germany: Hitler appears, but does not speak at the funeral in Munich of Gauleiter Adolf Wagner. This adds to Allied press rumors that Hitler has been locked in an insane asylum. Russian Front - North: Day 76 of 191 of the Battle of the Narva Isthmus, Estonia. Both German and Soviet troops remain in their defensive positions. Russian Front - South: Day 45 of 45 of the Battle of Chernovtsy, Ukraine. The Germans retreat out this area. Russian Front - South: Day 43 of 44 of the Battle of Snigirevka, Ukraine. Russian Front - South: Day 10 of 35 of the Battle of the Crimea. Russian Front - South: Day 10 of 60 of the Battle of Romania, 1st Jassy Offensive. MTO: US 15th Air Force B-17s and B-24s attack targets in Bulgaria and Yugoslavia. MTO - Italy: Day 92 of 123 of the Battle of Monte Cassino. RAF and US Air Forces provide air support. The German Gustav Line continues getting weaker. MTO - Italy: Day 87 of 136 of the Battle of Anzio. RAF and US Air Forces provide air support. CBI - Burma: Day 44 of 166 of the UK's Operation THURSDAY. CBI - Burma: Day 39 of 147 of the Battle of Myitkyina. US 10th Air Force provides air support. CBI - Burma: Day 17 of 302 of the Chinese Salween Offensive. US 14th Air Force provides air support. CBI - China: Day 2,477 of 2,987 of the 2nd Sino-Japanese War. Day 1 of 39 of the Battle of Central Henan, the first offensive in Japan's Operation ICHI-GO. Japanese troops begin attacking the US airfields in eastern China. CBI - India: Day 41 of 118 of the Battle of Imphal-Kohima. Anglo-Indian and Japanese troops clash at Garrison Hill and FSD Hill near Kohima. PTO - Caroline Islands: US 13th Air Force bombs at Satawan Atoll. PTO - Marshall Islands: US 7th Air Force bombs at Maloelap and Mille Atolls. PTO - New Guinea: Day 49 of 80 of the Battle of the Admiralty Islands. 5th Air Force provides air support. PTO - New Guinea: Day 212 of 219 of the Battle of Shaggy Ridge. 5th Air Force provides air support. PTO - New Guinea: Day 125 of 597 of the Battle of New Britain. US 13th Air Force provides air support. PTO - Solomon Islands: Day 169 of 295 of the Battle of the Bougainville Islands. US 13th Air Force provides air support. ETO - Netherlands: Day 4 of 5 of the Battle of Groningen. Canadian troops liberate Apeldoorn. ETO - France: Day 262 of 284 of the Battle of Brittany. ETO - France: Day 215 of 236 of the Siege of Dunkirk. ETO - Germany: Day 43 of 46 of the Battle of the Ruhr Pocket. US 9th Air Force provides air support. Field Marshal Model gives his remaining troops three choice. Try to go home, try to fight their way out of the Ruhr pocket, or surrender. Most decided to surrender. ETO - Germany: US 8th Air Force bombs railroad targets in eastern Germany and western Czechoslovakia. ETO - Germany: The German Ace fighter pilot August Lambert, with 116 kills, is killed while dog fighting US P-51 Mustangs. Russian Front - Finland: Day 215 of 223 of the Lapland War. Finland and Russia have joined forces to kick the Germans out of Finland's most northern province. Russian Front - Center: Day 185 of 206 of the Battle of the Courland Pocket in Latvia. Russian Front - Center: Day 5 of 13 of the Battle of Zemland, East Prussia. Russian Front - Center: Day 2 of 23 of the Battle of Settin-Rostock, both sides of the border between Germany and Poland. Day 2 of 4 of the Battle for the Oder-Neisse Rivers. Russian Front - Center: Day 2 of 17 of the Battle of Berlin. The Soviet 1st Ukrainian Front breaks through to Berlin. Russian Front - Center: Day 64 of 83 of the German Siege of Breslau (today Wroclaw, Poland). The Soviets continue with their siege. MTO: US 15th Air Force bombs targets in Italy, Germany, Czechoslovakia and Austria. MTO - Italy: Day 12 of 27 of Operation GRAPESHOT, a successful offensive in northern Italy. MTO - Italy: Day 9 of 13 of the Battle of Bologna. The US 5th Army continues pressing their attack. MTO - Italy: Day 6 of 8 of the Battle of the Argenta Gap. Brazilian troops capture Montese while the British V Corps captures Argenta. CBI - Burma: Day 73 of 99 of the Battle of Pakokku and Irrawaddy River operations in central Burma. The US 10th Air Force provides air support. CBI - China: Day 2,842 of 2,987 of the 2nd Sino-Japanese War. Day 17 of 91 of the Battle of Zhijiang. US 14th Air Force provides air support. Day 9 of 60 of the Battle of West Hunan (near Zhijiang). The US submarine USS COD sinks a Japanese tug and its tow in the East China Sea. PTO - Bonin Islands: US 7th Air Force P-51s attack vessels near Futamiko. PTO - Formosa: US 5th Air Force B-24s bomb airfields at Taichu, Shinshoshi, Toyohara and Okayama, while B-25s hit the airfield at Taito. PTO - Japan: US 20th Air Force B-29s bomb airfields at Tachiarai, Kokubu, Izumi, Nittagahara and Kanoya. PTO - Japan: Day 17 of 83 of the Battle of Okinawa. PTO - New Guinea: Day 477 of 597 of the Battle of New Britain. US 10th Air Force provides air support. PTO - New Guinea: Day 361 of 481 of the Battle of Western New Guinea. US 10th Air Force provides air support. PTO - Philippines: Day 180 of 299 of the 2nd Battle of the Philippines, aka the Liberation of the Philippines or the Philippines Campaign. PTO - Philippines: Day 124 of 244 of the Battle of Luzon. 5th Air Force provides air support. The Japanese rig explosives to their tanks and ram the US Sherman tanks near Baguio, but the explosives failed to detonate. PTO - Philippines: Day 39 of 159 of the Battle of Mindanao Island. 5th Air Force provides air support. PTO - Philippines: Day 31 of 135 of the Battle of the Visayas region. US 5th and 7th Air Forces provide air support. Middle East: Syria becomes independent from France. 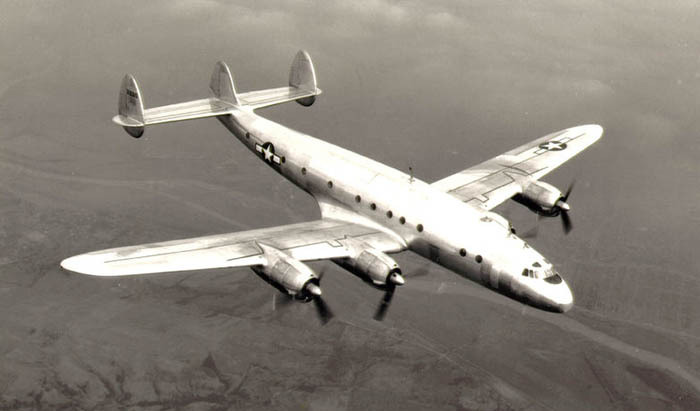 Designed just before WWII after special requirements from the American tycoon Howard Hughes, the Lockheed Constellation passenger liner is celebrated today as one of the finest flying machine ever built; plus it had a respectable military career. The brief but violent campaign to prevent the British from exerting control of the coastline of neutral Norway, while still fine-tuning his plans against France. Eleven tracks of classical and operetta music denounced as degenerate by the Nazi regime.